Ohio Wesleyan’s Erin Delaney (22) drives past a defender during the first half of Friday’s Bishop Classic/Hoops for Hope showdown against visiting Muskingum. 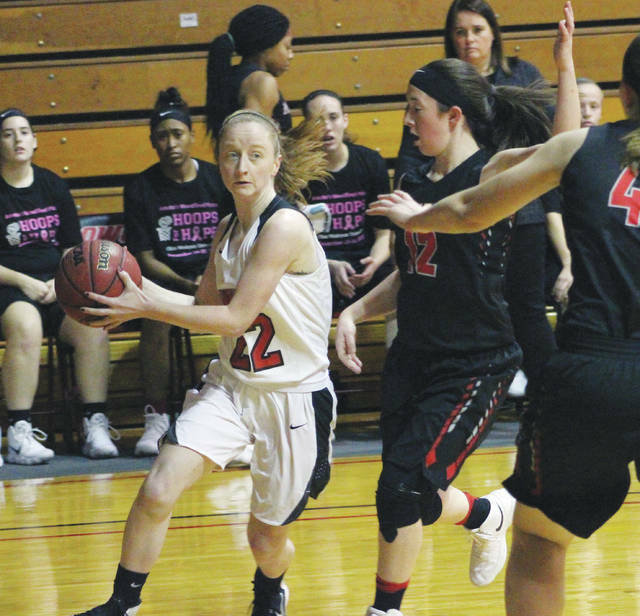 The Ohio Wesleyan women’s basketball team fell into the same old song and dance in Friday night’s 73-69 overtime loss to Muskingum to open the Bishop Classic/Hoops for Hope at Branch Rickey Arena. OWU has lost six of its games by five points or less and many of those loses have come the same way. The Bishops built a lead with a solid third quarter only to have it snatched away in the fourth. OWU used a 15-1 run in the third quarter to take control, turning a six-point deficit into a 39-31 lead with 3:53 left in the frame after back-to-back Erin Delaney baskets. The Muskies fought back from a 13-point deficit with a 21-8 rally in the fourth to tie it and send it to overtime. Kacie Leppla snared an offensive rebound for the Muskies and dumped it to Dana Parkman on the left for a layup. She knocked down the ensuing free throw to complete the comeback – tying the game 63-63 with 1:07 left. Neither team could get over the hump on its next possession. OWU had one final chance when Elea Karras found Meghann Dunning on a back-door cut, but her layup attempt rimmed out with 4 seconds left. Muskingam scored the last seven points in overtime to seal the win. Olivia Besancon had a game-high 27 points on the strength of five three-pointers to lead the Muskies (6-4), who extended their winning streak to four games. Alexandra Carson finished with 15 points and Parkman finished with nine points and nine rebounds. Delaney had 23 points and seven rebounds to lead the Bishops (1-9), Elea Karras had 18 points – all in the second half – and Nicole Popovich had a game-high 15 rebounds to go with eight points. Albion overcame an early 8-0 deficit by outscoring Carnegie Mellon 33-11 in the middle two periods on its way to a convincing win in the Ohio Wesleyan’s Bishop Classic/Hoops for Hope Friday night at Branch Rickey Arena. Brittany Leutz and Evelyn Wischmeyer led the Britons (8-3) with 12 points apiece. Wischmeyer also pulled down a team-high nine rebounds. Laurel Pereira had 10 points and nine boards to lead the Tartans (7-3). OWU plays Carnegie Mellon in the consolation game Saturday at 1 p.m. Muskingum and Albion follow in the championship game.